The goal of the Artful Thinking program is to help students develop thinking dispositions that support thoughtful learning – in the arts, and across school subjects. 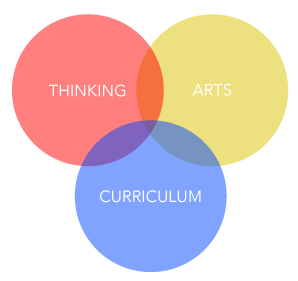 Artful Thinking has 6 interrelated components: The Artful thinking Palette (6 thinking dispositions at the heart of the program); thinking routines, works of art, curricular connections, visible thinking, and teacher study groups. Artful Thinking is a program that was developed by Harvard Project Zero in collaboration with the Traverse City, Michigan Area Public Schools (TCAPS). The program was one component of a larger TCAPS grant from the US Department of Education that aimed at developing a model approach for integrating art into regular classroom instruction. The purpose of the Artful Thinking Program is to help teachers regularly use works of visual art and music in their curriculum in ways that strengthen student thinking and learning. The Artful Thinking program is designed to be used by the regular classroom teacher. While it originally targeted grades K-12, the Artful Thinking approach is also currently used in post-secondary education and in museums. The program focuses on experiencing and appreciating art, rather than making art. It has two broad goals: (1) To help teachers create rich connections between works of art and curricular topics; and (2) to help teachers use art as a force for developing students’ thinking dispositions.